To win in emerging markets, move first. 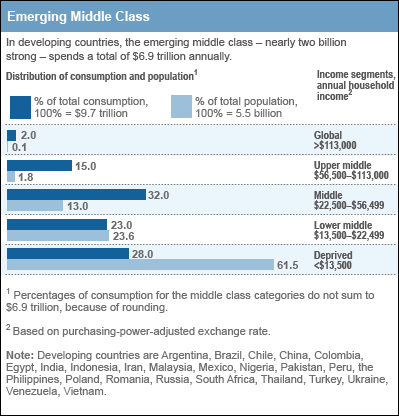 The developing world’s two-billion-strong middle class will increase its annual spending from $6.9 trillion today to $20 trillion — twice current U.S. consumption — over the next decade, McKinsey research suggests. These consumers will give early winners a chance to gain lasting advantages, just as occurred when consumption first boomed in the developed world. In 17 product categories in the U.S., for example, McKinsey found that the 1925 market leader remained the top or number-two player for the rest of the century.